Lamb’s quarters grow wild and are called “Myeongaju” (명아주) in Korea, where they are foraged in the mountains and fields in the spring. You can probably guess how excited I was to see these mountain vegetables growing in Inwood Park in Manhattan! I’ve seen them in Central Park, too. So I picked some young leaves and brought them home to cook for dinner. The best time to forage for Lamb’s quarters is in the spring. I found them in the early summer, and they were still good to eat but I could only pick the youngest leaves from the top. They are so soft in the spring you can eat the whole plant, including the stems, but by the fall the stems are so strong that Koreans make canes from them! If foraging is too much work for you, you might be able to find them for sale at your local farmer’s market. If you can’t find them anywhere, don’t worry. Just replace the lamb’s quarters in this recipe with some other green vegetable like napa cabbage, Bok Choy, sweet potato stems, spinach, Chinese broccoli, or chards. In this recipe I use doenjang as a key ingredient, but you could also use soy sauce. The seasoning paste in this recipe will lead to your irresistible satisfaction! Enjoy the recipe! Boil 3 quarts of water. Blanch the lamb’s quarters for about 1 to 2 minutes, until the leaves are tender. Strain and rinse them in cold water a couple of times to stop them from cooking and to to remove any dirt. Strain and squeeze out any excess water. If the leaves and stems are too long, cut them a few times into bite-sized pieces. Put them into a mixing bowl and add soybean paste, hot pepper paste, garlic, green onion, and sesame oil. Mix by hand until all the leaves are well coated with the seasonings, and have absorbed them. You can wear disposable plastic gloves if you want. Sprinkle with sesame seeds and transfer to a serving plate. Serve as a side dish to rice. Posted on Saturday, July 6th, 2013 at 12:16 pm. Last updated on April 26, 2015. Posted April 18th, 2018 at 12:07 pm | Log in to reply. Looks really good. I live in LA, I also find lamb’s quarters in the farmers’ markets here, and sometimes I find them growing wild as well. Another wild vegetable we have a lot of (and I’ve seen it sold at the Korean markets) is mallow ( I believe it is 아욱 in Korean). 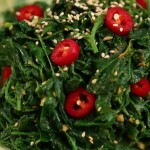 Maangchi, do you have any recipes for this, or do you prepare it similarly to the lambs’ quarters and other greens? Posted April 19th, 2018 at 8:08 am | Log in to reply. Yes, Koreans make soup or porridge from 아욱. I will post the recipe someday! Posted July 1st, 2014 at 2:39 am | Log in to reply. Can I also use the seasoning in this dish for minari? Posted March 13th, 2014 at 12:05 am | Log in to reply. Hi Maangchi, I love this video to death I going to look for lamb’s quarter this spring. Maangchi I have lots of food but I love foraging because its it’s 100% organic and healthy so Keep foraging recipes coming. Thank You! Posted July 15th, 2013 at 11:55 pm | Log in to reply. 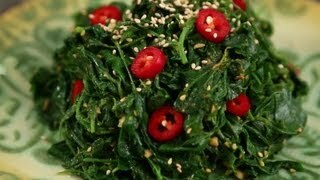 I just watched your video on Youtube, which is showing how to make cubed radish kimchi. It’s very easy to learn following your instruction. And I already make it, but waiting to taste it. (Can’t wait to taste it). Can you teach how to make Spicy raw crabs please? I searched on Youtube, but there’s only one, and I don’t think I would like that taste. I also searched here, but there’s no. Can you please teach me? Thanks so much. Posted July 7th, 2013 at 12:24 pm | Log in to reply. This recipe was originally posted on July 6, 2013 at 12:16 pm by Maangchi. It was last updated on April 26, 2015. The video was watched 70,816 times on YouTube & has 979 likes!